The workshop, organised by the Deendayal Antyoyadaya-National Urban Livelihood Mission (DAY-NULM) component of the Ministry of Housing and Urban Affairs was a platform to bring relevant state authorities together and to acquaint them with the status of implementation of the Street Vendors Act 2014 in their respective states as per the findings of our Street Vendors Act compliance Index 2018. It was chaired by the Mr Sanjay Kumar, the Joint Secretary of the Ministry of Housing and Urban Affairs. The State Mission Directors of the 'Support to Urban Street Vendors' group operating under DAY-NULM were present along with delegates from each state. We presented the findings from our research of compliance of states with the Street Vendors (Protection of Rights and Regulation of Livelihood) Act, 2014. The data received from NULM was used to calculate an index and rank states according to their compliance status for our annual research publication Street Vendors Act Compliance (SVAC) Index which covered 28 states and 2 union territories. Mr Kumar shared his inputs regarding the research methodology and the current status of implementation of the Street Vendors Act across the states. 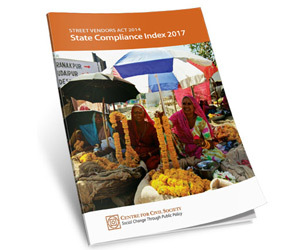 Our first edition of the Street Vendors Act Compliance Index Report was published in 2017, ranking 23 states on their compliance with the Act. The full report can be found here.